There is absolutely nothing original about Christopher Landon's comedy slasher reskin of Groundhog Day...and that's perfectly fine. 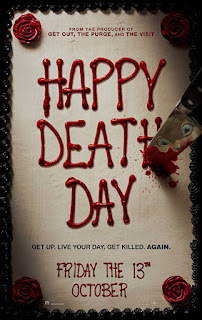 Taking the overdone notes of "selfish loner must experience life threatening peril to change" and mixing them with every possible college stereotype, Happy Death Day cannot help but be everything it is expected to be and this is its strongest advantage. It just can't resist being a thoroughly enjoyable horror romp from start to finish. Theresa AKA “Tree” is a self-centered party girl who is murdered by a masked killer en route to yet another party. She re-awakens on her birthday, reliving the same fateful day over and over again, forcing her to confront her personal demons in order to once and for all break her temporal curse and expose her killer's identity. Scott Lobdell’s script keeps the twists and turns spinning within a kinetic vortex. Jessica Rothe's Tree glides through each repeat, shedding layer after layer of shallowness to reveal a brilliant core of empowerment. While Bill Murray's lovable rogue's key to salvation lies in love, Rothe's heroine has to fight at every turn and the film is best when everything takes a backseat to her smile inducing embrace of circumstance. Everything is neatly telegraphed, but it is her journey that provides most of the film's magnetic viewing experience. Rachel Matthews supports as Tree's villainous Sorority president, a walking embodiment of every meme ever written on the subject. Israel Broussard stars as Tree’s possible love interest, but even this angle is sidelined for the main event. This is the double-edged sword of the film. On one hand, it could have been interesting to see Tree fatalistically indulge in her predicament, but Rothe, and Landon are having too much fun, and while this keeps everything within Happy Death Day at surface level, it is an above board, comfortably ridiculous place to find oneself. Toby Oliver lenses the film, keeping Rothe in almost every frame. While this tactic was nerve wracking in mother!, here it is yet another dollop of camp that only enriches the film's slim running time. Each sequence is framed in a manner that allows the viewer to gain a new piece of the puzzle before Tree’s inevitable re-demise. In theaters tomorrow, Happy Death Day is a hilarious, cringe filled mixture of comedic horror and coming of age conventions. This is the kind of film that is the definition of pure entertainment and a great addition to carefree Halloween viewing traditions. Low on violence and high on predictability; it's fast, fun, and almost forgettable...and sometimes, that's alright.